Boston – Researchers from the Grayken Center for Addiction at Boston Medical Center have published the first study linking higher levels of opioid pharmaceutical marketing to physicians with overdose deaths. 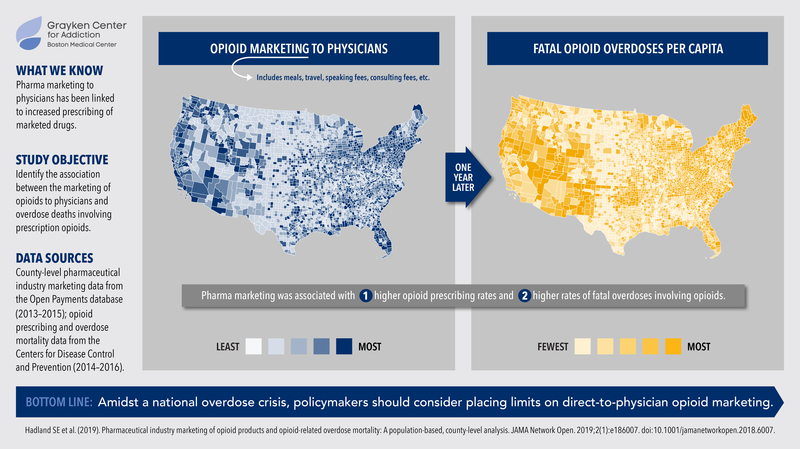 Published in JAMA Network Open, the data show that, across US counties, when physicians prescribe more opioids, the number of prescription opioid overdose deaths is higher, and that this is driven by opioid pharmaceutical companies marketing their products to physicians. Overdose deaths and opioid prescribing were more strongly linked with the number of marketing interactions, not the total money spent, indicating a pressing need to address how low-cost but widespread marketing activities, such as industry-sponsored meals, are regulated. Using the Open Payments database, the researchers conducted a county-level analysis of pharmaceutical marketing information for a 29-month period between 2013 and 2015. For every US county, they pulled information on: dollars spent by opioid pharmaceutical companies on marketing to physicians; the number of payments made by these companies; and the total number of physicians who received any marketing. Next, they pulled data from the US Centers for Disease Control and Prevention on opioid prescribing and overdose deaths across all counties during the window of time one year later, between 2014 and 2016. They staggered the data by one year in order to see how the marketing interactions impacted overdose deaths a year later. Between Aug. 2013 and Dec. 2015, there were 434,754 non-research payments made by opioid pharmaceutical companies, totaling $39.7 million, to 67,507 physicians across 2,208 counties. The marketing interactions and payments to physicians include paying for physicians’ meals, travel costs, speaking fees, honoraria, and/or consulting fees. The data showed that the more opioid marketing a county received, the higher the burden of overdoses from opioid prescriptions. This was the case regardless of the amount of money spent in the county, the number of payments, or the number of doctors receiving marketing. “In the midst of the opioid epidemic, it is critical to address what may be contributing to people misusing and overdosing on prescription opioids, and our study indicates that, across the country, marketing to doctors may strongly influence these outcomes,” said Scott Hadland, MD, a pediatrician and researcher at BMC’s Grayken Center for Addiction. Opioid overdose death rates continue to increase nationally, with recent data estimating that 72,000 Americans died of a drug overdose – involving both prescription and illicit drugs – in 2017. Prescription opioids are involved in approximately one third of all opioid overdose deaths, and most people who misuse prescription opioids receive them from physicians who prescribe them. In addition, prescription opioids may be the first opioid that individuals encounter before transitioning to using heroin or fentanyl. This study was funded in part by the National Institute on Drug Abuse. Collaborators on this study include senior author Magdalena Cerdá, DrPH, associate professor of population health and director of the Center of Opioid Epidemiology and Policy at NYU School of Medicine; Ariadne Rivera-Aguirre, MPP, from the department population health at NYU School of Medicine; and Brandon D. L. Marshall, PhD, from the department of epidemiology at Brown University School of Public Health.